More than 1,700 Risperdal lawsuits have been filed in Pennsylvania on behalf of plaintiffs who allegedly developed female-like breasts or other complications due to the antipsychotic medication. "We are pleased that the Court saw fit to uphold this verdict, finding that the plaintiff presented sufficient evidence to show that negligence on the part of Janssen Pharmaceuticals led to his excessive breast development. In reducing the award, the Court determined that Maryland law applied to the case, as that is where the plaintiff resides. The final damages are the maximum amount allowable under that state's law," said Sandy A. Liebhard, a partner at Bernstein Liebhard LLP, a nationwide law firm representing the victims of defective drugs and medical devices. The Firm is currently representing a number of Risperdal plaintiffs, and continues to provide free legal reviews to individuals who allegedly developed gynecomastia due to their use of the antipsychotic medication. Johnson & Johnson and it Janssen Pharmaceuticals unit are currently facing at least 1,701 Risperdal lawsuits that have been centralized in a mass tort program currently underway in the Philadelphia Court of Common Pleas. All of the cases were filed on behalf of individuals who allegedly experienced gynecomastia and other complications related to their use of Risperdal. Plaintiffs accuse the drug makers of concealing the medication's serious side effects and of failing to warn doctors and patients of these risks. (In Re: Risperdal Litigation, Case Number 100300296). Risperdal patients who allegedly developed gynecomastia connected with its use may be eligible to file their own lawsuit. 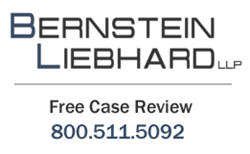 To learn more about the ongoing Risperdal litigation, please contact Bernstein Liebhard LLP for a free case review by visiting the Firm's website, or by calling 800-511-5092.